SPECIAL up to 15% off! Buy 2: 10% Off both! Buy 3+: 15% off all! 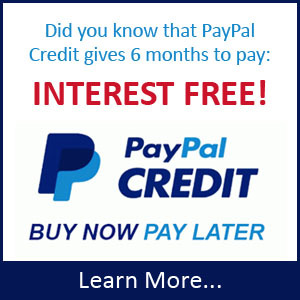 go to ActiVet® Build Your Own, also up to 15% Off! Scroll & “Check” the boxes of the brushes you want. A QTY box will appear – choose your QTY. Scroll to the end to see your Discounted Total. If you don’t choose ANY brushes the order will be void. 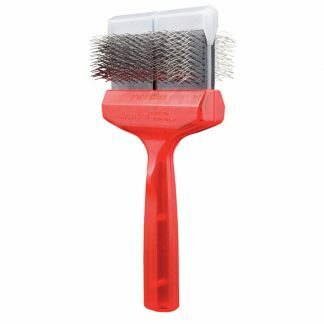 Extreme De-matting brush. Special bristle design breaks mats even faster! The ultimate tool in dematting – up to fifty times better due to the unique layout of the bristles! Designed for the toughest of mats. It helps extend the life of your other brushes as it is the first line of defense in ‘Emergency’ coat situations! The ultimate tool in dematting! This brush demats up to fifty times better than the firm brushes due to the unique layout of the bristles. It does not take out as much undercoat. Designed to be used on the toughest of mats it helps extend the life of your other brushes as it is the first line of defense in ‘Emergency’ coat situations! It’s the perfect matted dog hair remedy. Firm brush-head, firm special mat-breaking bristles. When you look at a full collection of ActiVet brushes it is truly exciting! The highest quality brushing tools available in the industry that will cut your brushing time in half! With all the different colors and combinations, it may appear to some to be a complicated choice, but in reality it is quite simple. The magic in these brushes are a combination of the flexible heads, and the different patterns and configurations of the pins on their faces. Together, these features will cut your brushing time in half, do a superior job on the coat, and save years of stress and strain on your wrist and forearm! With 18 brushes all together (9 single width, 9 double width), the question always is…which ones to choose? Again, the answer is much less complicated than it appears. There are only two different flexibilities in the brush head, and three different configurations of the pins on their faces. The colors of the brushes indicate which combination of head flexibility and pin configuration you are working with. All ActiVet brushes have rounded pins made of the highest quality German stainless steel, are waterproof, can be effectively cleaned (even behind the pads), and give you the ability to repair or replace the pins should they get bent or twisted; the only professional grooming brush that you can actually repair yourself! 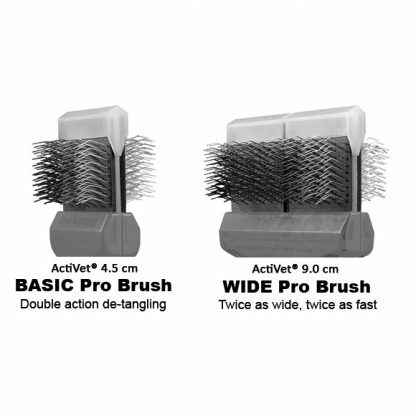 The flexible brush heads on ActiVet brushes absorbs the brush strokes when brushing so there is less tangling, less tearing of the coat, and less strain on the groomer. Although personal preference will always play a role, most professional stylists prefer the firmer brush heads to the soft. When we instruct stylist in their use, we always suggest that it is better for them to “ramp-down” the pressure they apply with a firmer brush than “ramp-up” with one of the softer heads. This does a more effective job with the task at hand and saves strain on the brusher as well. Although “back-brushing” (an upwards stroke where the bottom of the brush handle leads the stroke) is a techniques some use, the ActiVet line is really designed to be used with a downward “tap & pull” motion, and never sideways. Of course, with smaller softer coated dogs, the more forgiving, softer flex brushes are the perfect choice and also serve well for some of the tighter and more delicate spots like under the legs, behind the ears, and in the sanitary areas. The flexibility maximizes penetration as it makes the head do more of the work, your wrist and forearm do less, and significantly cuts down your brushing time. As mentioned earlier, there are 18 different ActiVet brushes, but only 3 different pin patterns on any of their faces; each designed for a specific task. There is the Mat Breaking pattern, the Finishing pattern, and the Undercoating pattern. MAT BREAKING (RED BRUSH) PATTERN – When you look at the face of the Activet MatZapper you will see that the pins are set in varying directions and patterns. It is designed this way, because the mats they are made to break down are comprised of very random pattern knots and snags. The varying pattern of the pins of this firm headed brush by design penetrate more pins into the mats at different angles, so when the stylist use the “tap & pull” technique it explodes the mats in half the time. This design is so effective that you can actually work through heavily matted coats that you may have otherwise had to shave down. 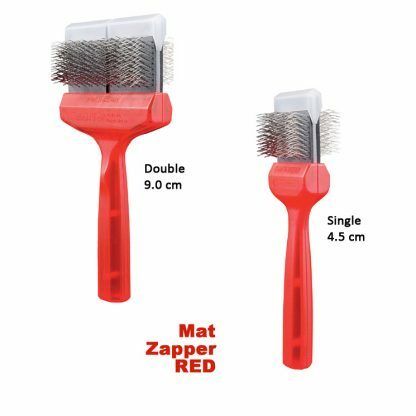 The RED MatZapper is a must-have tool for all groomers. FINISHING (PURPLE OR GREEN BRUSH) PATTERN – When you look at the face of both the Pro Firm Purple and Pro Soft Green ActiVet Finishing brushes you will notice two very specific traits. First, the pins are very linear in their layout. This is so they leave the coat with an even and smooth appearance. You will also notice that the pins themselves have a relatively short shank with a more pronounced hook on the end. It is designed this way so the brush remains on the outer coat, where the finishing work needs to be done, and does not penetrate to the undercoat. The only difference between the Purple and the Green brush, is the flexibility of the head. The Purple is firm, the Green is soft. The faces of these two brushes are identical. UNDERCOATING (SILVER OR GOLD) PATTERN – For double-coated dogs, there is nothing more arduous than removing all that dead fur from deep under the topcoat. Any groomer that has had to work through a large Husky or Samoyed will attest that it is truly a formidable task. The 2 ActiVet Undercoating brushes will give you back half the time and relieve half the stress of this undercoating undertaking! When you look at the pin pattern on both the Silver Firm CoatGrabber and the Gold SuperSoft CoatGrabber brushes you will see that like the Finishing brushes, the pattern is very linear. The pins themselves, however are quite different. The Undercoating brushes have a long, thin pin with a very tiny hook on the end. This pattern is specifically designed to quickly plunge through the topcoat, and get right down to the undercoat. This helps streamline the brushing process significantly, cutting down on pressure needed to penetrate the topcoat while the small hooks engage more of the deep undercoat. The Silver is the firm flex, the Gold is the soft flex. The faces of both of these brushes are identical. So three different configurations (Mat breaking, Finishing, and Undercoating) and two different flexibilities (firm and soft) in both single and double comprise the entire standard Activet Set. When ActiVet re-introduced these wonderful tools under their own name (they had been manufacturing them for a shampoo & fragrance company’s name for many years), they introduced a truly revolutionary new concept with the rollout. The DUO’s….. 2 brushes in one! 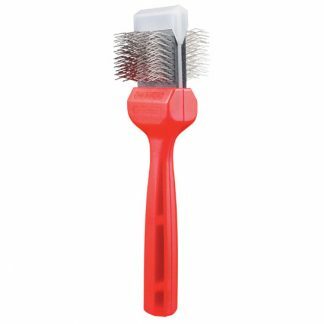 Since only two head flexibilities are offered, the alternate sides of each brush could carry a different pin configuration for different jobs. That meant twice the tool-power, at a fraction of the cost. Stylists that were breaking mats could simply flip the brush over to feather or finish all in one motion. You could now MatZap and Finish or Undercoat and Finish or MatZap and Undercoat with the very same brush! Much more effective, Much more efficient, MUCH more affordable! 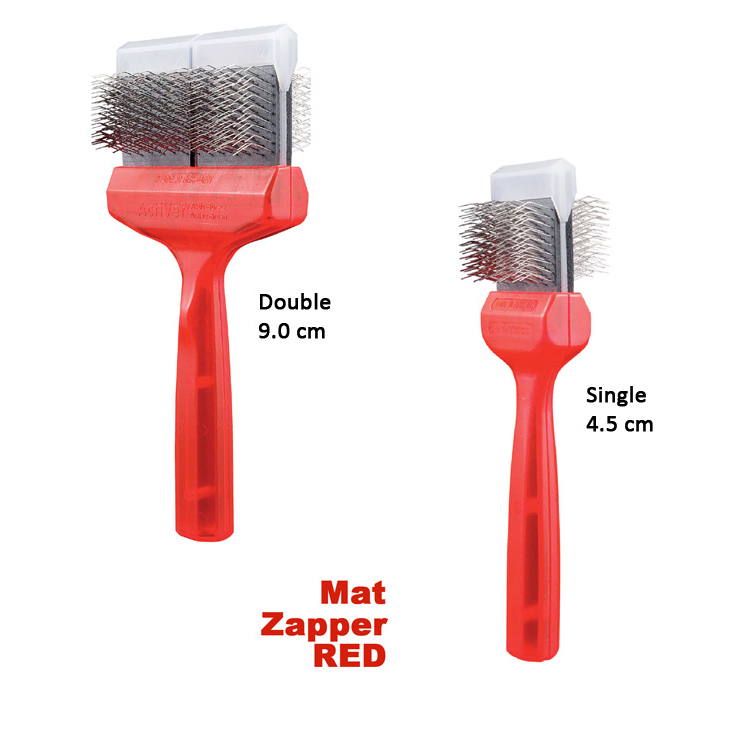 The TuffZapper Coater – Red/Purple Firm Flex – A combination of the Red MatZapper and the Pro Firm Purple finishing designs. The SilCoater – Green/Gold Soft Flex – A combination of the Pro Soft Green Finishing and the Gold Supersoft Coatgrabber undercoating designs. The TuffFinisher – Purple/Silver Firm Flex – A combination of the Pro Firm Purple Finishing and Silver Firm Coatgrabber undercoating designs. The UnderCoater – Red/Silver Firm Flex – A combination of the Red MatZapper and the Silver Firm Coatgrabber undercoating design. ActiVet® Brushes are designed to work with a “light hand,” do not push down while brushing. Please read the included instructions on proper brushing technique. If you push down too hard the brush handle may break and will NOT be covered in this Limited Warranty. Groomers Helper® warrants to the original purchaser that all ActiVet® Brushes shall be free from defects in material and workmanship at time of shipment and shall be valid for up to 90 days from the time of purchase. Groomers Helper® obligations under this Limited Warranty shall be limited to repairing or replacing, at its option, free of charge, any product returned to Groomers Helper® freight prepaid.